Someone in Canada is currently selling a power lead for the PS-F5 and PS-F9 which plugs into any USB port. They do a 3.5′ white version with Apple branded USB plug, and a black generic version @ 10′. Both sell for the same price of $14.99 plus shipping of $4.99 inside the U.S.
As of September 2010 the seller hasn’t had them for a while, but this link will show you what PS-F5 related stuff they’re currently selling. This entry was posted on Friday, July 3rd, 2009 at 11:06 am and is filed under Accessories, ebay, Sony PS-F5, Sony PS-F9. You can follow any responses to this entry through the RSS 2.0 feed. You can leave a response, or trackback from your own site. Hi! 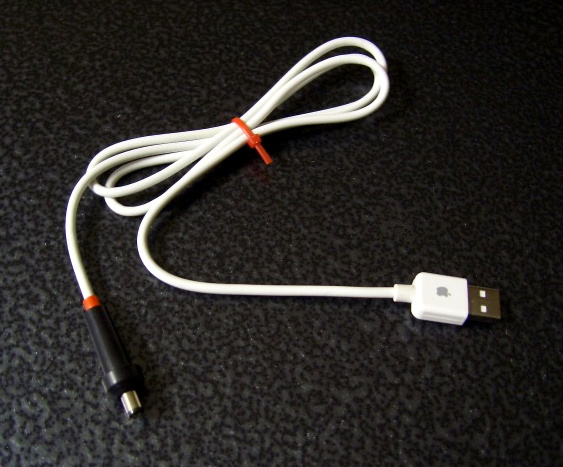 I just recently bought a PS-F5, but it didn’t come with a power supply, so I’m thinking about making me one of these USB power cords (as the eBay seller doesn’t exist anymore). Hello & thanks for visiting. P.P.S. Be great if you’d post back here with your results.